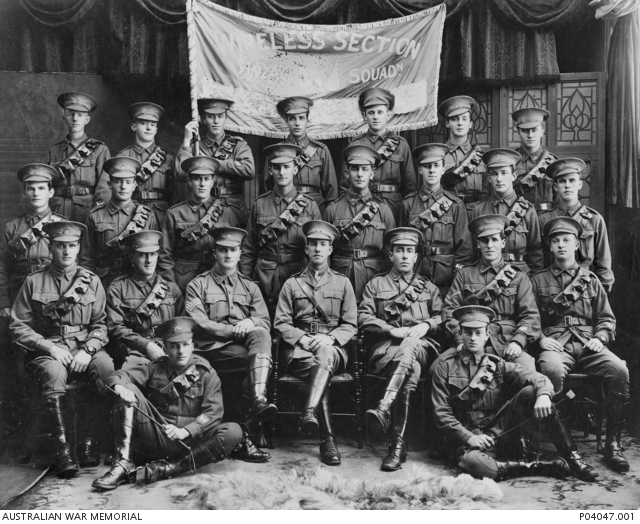 Group portrait of members of the April Reinforcements, Wireless Section, Anzac Squadron. Identified, left to right, back row: 18336 Sapper (Spr) Morville William Edward Wraxall, of NSW, enlisted 6 November 1916 and returned to Australian (RTA) 11 July 1917; 18327 Spr Charles Stanley Howitt, of Qld, enlisted 26 July 1916 and RTA 28 January 1919; 18337 Spr Henry O’Hagan, of NSW, enlisted 27 October 1916 and RTA 16 January 1919; 18320 Spr Claud Victor Sior, of Vic, enlisted 27 December 1916; 19234 Driver (Dvr) Alfred David Eves, of NSW, enlisted 7 October 1916 and RTA 29 April 1916; 18604 Dvr Ernest Watkins Williams, of NSW, enlisted 9 November 1916; 18330 Dvr Albert Edward Short, of NSW, enlisted 23 October 1916 and RTA 28 June 1919. Third row: 18326 Spr Harold Alexander Hill, of NSW, enlisted 14 November 1916 and RTA 26 July 1919; 18319 Spr Augustus Wharton Paul, of Vic, enlisted 13 January 1917 and RTA 28 June 1919; 18324 Spr Alfred Preston Watson, of Vic, enlisted 23 December 1916; 18325 Spr Robert Francis Dodds, of Vic, enlisted 8 December 1916 and RTA 26 July 1919; 18332 Spr James Alexander M Tait, of WA, enlisted 8 June 1916; 18321 Spr Rupert Henry Treganowan, of Vic, enlisted 27 November 1916 and RTA 26 July 1919; 18329 Spr William John Morris, of NSW, enlisted 2 December 1916 and RTA 28 January 1919; 18328 Spr Thomas Patrick Maher, of NSW, enlisted 11 December 1916 and RTA 2 August 1919. Second row: 18323 Dvr Robert Crawford, of Sydney, NSW (originally of Waitakuna, New Zealand), enlisted 23 November 1916 and RTA 3 July 1919; 18318 Spr Alfred Mark Mitchell, of NSW, enlisted 4 November 1916 and RTA 16 March 1919; Sergeant (Sgt) (later Lieutenant (Lt)) Rex Wheddon Parsons, of Unley, SA, enlisted 25 January 1917 and discharged 11 September 1919; Lt (later Captain) John Douglas Crawford, of Vic, enlisted 18 February 1916 and RTA 22 July 1919; 18335 Lance Corporal (LCpl) Theodore Leopold Whitehall, of NSW, enlisted 21 July 1916 and RTA 4 March 1919; 18322 LCpl James Gray Bennett, of NSW, enlisted 23 October 1916 and RTA 26 July 1919; 18331 Spr Harold William Stewart, of NSW, enlisted 30 October 1916, and died of typhus in Egypt on 18 June 1918. Front row: 18333A Spr William David Tomlins, of NSW, enlisted 12 October 1916 and RTA 13 March 1919; 18316 Spr Reginald Frank Clarke, of WA, enlisted 12 November 1916, and died of sickness in Egypt on 8 April 1919, aged 21.